The brouhaha around the ninth Star Wars installation, Star Wars: The Rise of Skywalker, more or less broke the Internet when the movie's epic teaser dropped. What's been driving people mad with theories is the promo's ominous ending, which features Emperor Palpatine's haunting laughter. Is he a Force spirit? If not, how could Palpatine be alive? As we're introduced to the potential villain of the upcoming movie, we can't help but wonder if there's a connection between Palpatine and the sequel trilogy villain Snoke. It's easy to draw a link between them because they both wield the dark side of the Force and are the evil masterminds behind the Republic and the First Order. Plus, there's evidence to believe that Snoke, the former Supreme Leader of the First Order, has actually been Emperor Palpatine all this time. But wait. Aren't both Palpatine and Snoke dead? Even if Palpatine is Snoke, does it matter? Well, let's rewind what happened to them to understand this theory's implications. 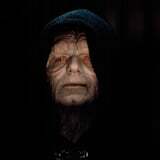 First, we need to consider when we last saw Palpatine in the Star Wars timeline. Palpatine has been dead for a long time. In Episode VI, he faces off with Luke Skywalker, attempting to electrocute the young Jedi into a crisp. Darth Vader, however, tosses Palpatine into a chasm to save his son. It looks like the evil Sith is intergalactic toast when the Death Star blows up. Let's fast forward to The Last Jedi. When Kylo Ren throws his lightsaber at Snoke, he slices the Supreme Leader in half in a rather grisly scene. While both villains look pretty dead, there could be a symbiotic connection between the two of them that would explain Palpatine's potentially alive status in Episode IX. To sketch out the Snoke is Palpatine theory, we have to look at the 1992 comic series Dark Empire. In it, Palpatine is resurrected in a clone body, even managing to turn Luke Skywalker to the dark side for a hot second. He can transfer from body to body after death (though he'd have to make a move fast because of his immense dark energy). Based on this comic, Snoke could be Palpatine, possibly a clone gone wrong. After Kylo Ren kills Snoke in The Last Jedi, Palpatine could have found another host body. Alternatively, Palpatine could be Snoke's apprentice. In Revenge of the Sith, Palpatine, trying to convert Anakin, talks about Darth Plagueis, a Sith Lord who could use the Force to influence Midi-chlorians to create life and prevent his friends from dying. Knowing that Anakin was worried about his wife's life, Palpatine said that Darth Plagueis transferred his knowledge to his apprentice, who eventually killed him. Guess who his apprentice was? Palpatine. This second theory could imply that Darth Plagueis survived and took the form of Snoke after using his knowledge of Midi-chlorians. Palpatine might not be dead either if he really got his hands on his master's secrets. Does all of this sound dubious? Well, consider the fact that Snoke has a ring in The Last Jedi that connects him with the former Emperor. The symbols on this trinket allude to the contentious Four Sages of Dwartii. It's worth remembering that Palpatine previously had statues of the sages in his own office. We'll have to wait until Dec. 20 to figure out if this is relevant plot-wise, or if it's just a fun Easter egg.